Call us today for quick, professional repairs. If you’re seeing any of the telltale signs of hard water — soap scum on your hands and hair, sinks and bathtubs, scale build-up on plumbing fixtures, spots on cutlery, glassware and mirrors — it may be time for a water softener. Renting a water softener from Reliance™ is an easy way to improve the water quality in your home. For about a $1 a day, you’ll make your family more comfortable and could help make your appliances more efficient. Are you experiencing the uncomfortable effects of hard water? can benefit you and your home. 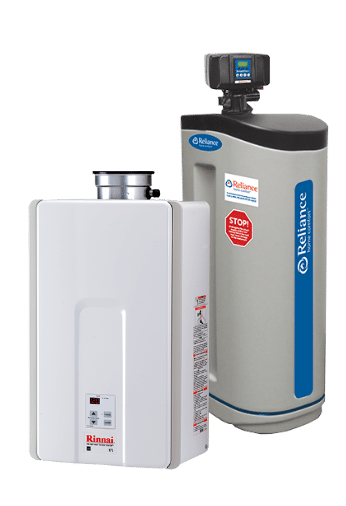 Renting a Reliance water heater and water softener bundle provides comfort and savings. ‡This promotion is only available in Ontario, Greater Vancouver, Calgary, Edmonton, Regina, Saskatoon and Winnipeg areas when purchasing and financing a water purification package with deferred financing for 3 months. Products may not be available in all areas. Monthly payments will commence, and interest will start to accrue 3 months from the date of installation, at rate of 14.9% per annum. Financing is OAC. Customers must pay an upfront search/filing fee of $49 when financing. Financing example: RO system for $1,243 including 13% HST in Ontario. With zero down payment and a 60-month amortization, the monthly payment is $29.53 in Ontario. Cannot be combined with any other offer. Offer expires June 30, 2019. Contact us for details.